Perfectly cut marble assembled together for this Modern Marble Fireplace. The contemporary feel of this fireplace is obvious. 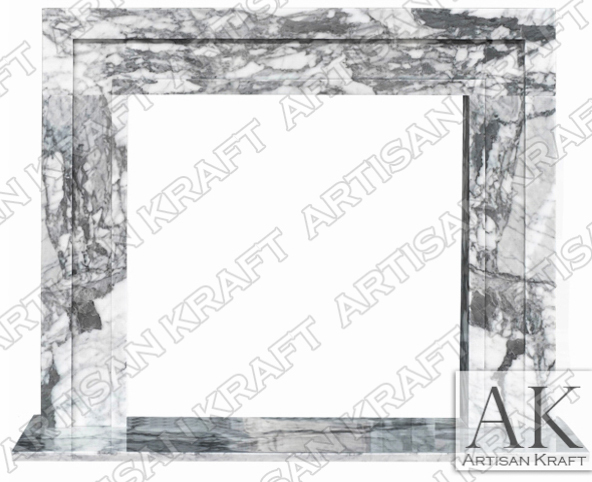 What softens is the natural black veining that paints this frame style surround. The look is that of Carrara but this is actually Italian Arabescato. A more expensive but clearly worth it stone. Italian Arabescato comes from Italy and is carved to make this stately modern mantel. There are clear difference from Carrara and our customers are overwhelming more excited about this material than Carrara. This is part of our exclusive high end Black Label Collection. Pictured in Italian Arabescato marble in a polished finish.